Tuber from the Peruvian Andes. 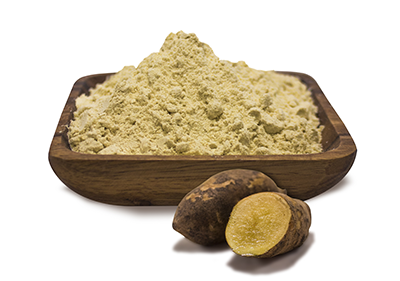 Yacon roots are sliced, dehydrated at low temperature, then kept as slices or milled into a fine powder. Fructooligosaccharides (FOS), a unique type of sugar (inulin) that can't be absorbed by the body. FOS also acts as a prebiotic, serving as food for the "friendly" bacteria in the colon. As an alternative sweetener in smoothies, desserts, teas and mixed with other flours for muffins and cookies. As slices as a snack and into salads. Low glycemic, low calorie and as a prebiotic is good for digestion, stimulates positive colon health, and helps with the absorption of calcium and vitamins.